Learn how to change your pricing plan. 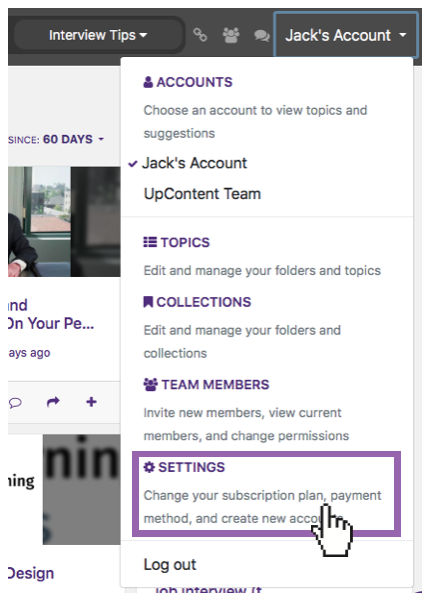 To change your pricing plan - whether upgrading or downgrading - begin by clicking on the account name at the top right of the screen. Click on the appropriate account to open a drop-down menu from which you can select "subscription plan". From here, you can toggle between the subscription options and click "Change" to complete the process. Learn more about the differences between our pricing plans. NOTE: In order to upgrade your subscription, you will need to have an active credit card on file with us. Add one by clicking on "Payment Method" from the same drop down menu from before. If you have issues, try these trouble shooting tips.